(Phys.org)—Private company Moon Express has announced via its website its plans for exploring the moon—plans that include sending three craft to the moon over the next three years. Officials with the company have also been speaking with the press regarding their ambitions. 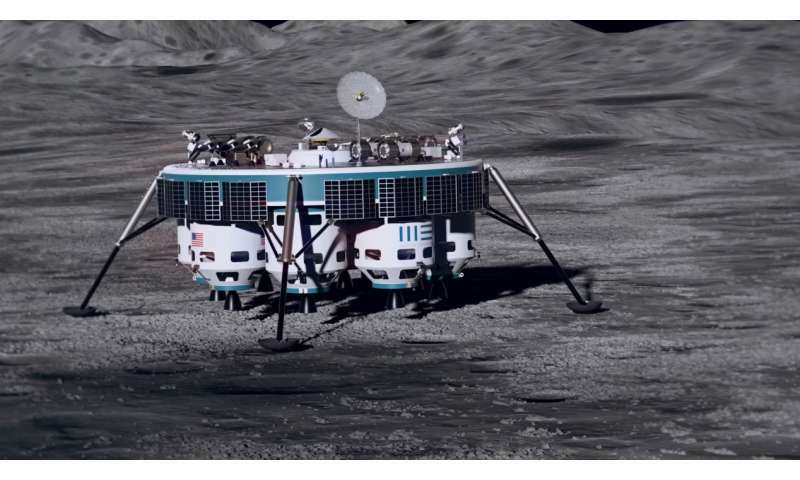 As noted on the website, to date, just three entities have sent working craft to the surface of the moon, all of them big governmental operations (U.S., U.S.S.R. and China). The aim of the team at Moon Express is to change that by giving some degree of moon access to non-governmental people. To that end, the company has three missions planned. The first involves sending a probe to the moon's surface; the second will seek to set a working research apparatus on the moon's south pole. The third and most ambitious mission will involve sending a vehicle to the surface of the moon that will be capable of mining moon dust and then bringing it back to Earth. Officials at Moon Express are promising to make samples of moon dust and/or rocks available to ordinary people upon its return—though it is assumed the samples will be auctioned to the highest bidders to help pay for the program. At the core of the initiative by Moon Express is the idea that sending vehicles to the moon can be done without spending billions, which makes sense for them, because they are also claiming to be self-funded. The plan is to use the same modular design for all three missions (and others in the future), which, of course, means reduced cost. The first vehicle is called the MX-1E and it is billed as a high-performance craft that is both eco-friendly and technically advanced. It is slated to launch atop a rocket made by Rocket Lab. The second mission will utilize the MX-1E Scout Classic—it will carry a host of scientific equipment for placement at the south pole—a location that allows for solar-powered instruments and also for constant communications with the Earth. For the third mission, the company plans to send an MX-2 to the moon, use it to retrieve surface samples, and then send part of it back to the Earth carrying the samples. The company also has plans for larger MX-5 and MX-9 vehicles to be sent to the moon in the future, each capable of carrying more equipment or return lunar material to Earth for sale. I am just drooling over the possibility of salvage on that and other landers left on the moon surface. Orbital salvage would more than pay for itself in precious metals and likely 'hush money' from various governments/corporations to keep the tech on board some of them critters secret or 'ransoming' them back to original owners. Objects on the moon, on the other hand, should probably be protected as 'parks' dedicated to those earlier explorers. For some of the missions which crashed, I think that researchers would like them left in place, for now, so that they can be later studied for why the craft went out of control or failed. Besides, most of those objects on the moon would not be high-value salvage and the cost of getting them back from the moon would be way above and beyond any financial reward for them.